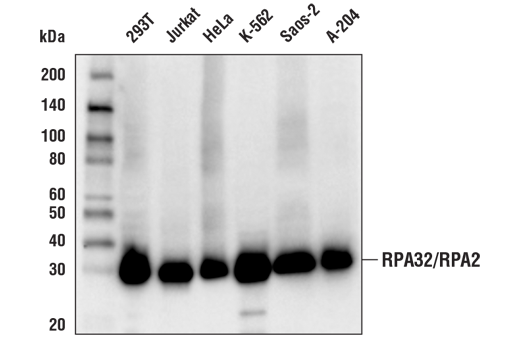 Western blot analysis of extracts from various cell lines using RPA32/RPA2 (E8X5P) XP® Rabbit mAb. Immunoprecipitation of RPA32/RPA2 protein from HeLa cell extracts. Lane 1 is 10% input, lane 2 is Rabbit (DA1E) mAb IgG XP® Isotype Control #3900, and lane 3 is RPA32/RPA2 (E8X5P) XP® Rabbit mAb. Western blot analysis was performed using RPA32/RPA2 (E8X5P) XP® Rabbit mAb. 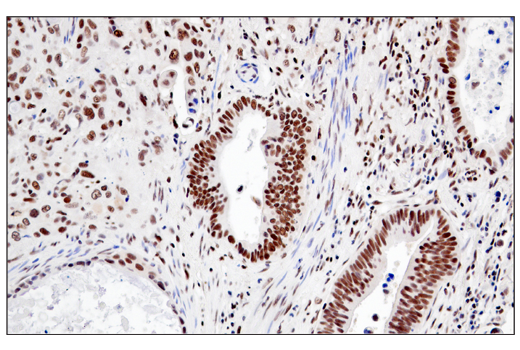 Immunohistochemical analysis of paraffin-embedded human colon carcinoma using RPA32/RPA2 (E8X5P) XP® Rabbit mAb. 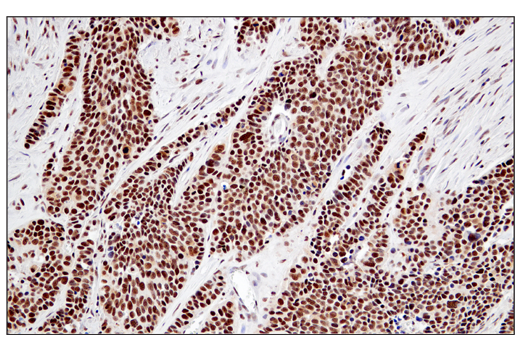 Immunohistochemical analysis of paraffin-embedded human esophageal carcinoma using RPA32/RPA2 (E8X5P) XP® Rabbit mAb. 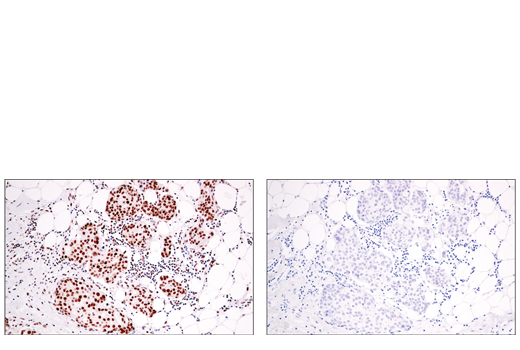 Immunohistochemical analysis of paraffin-embedded human ductal breast carcinoma using RPA32/RPA2 (E8X5P) XP® Rabbit mAb (left) compared to concentration matched Rabbit (DA1E) mAb IgG XP® Isotype Control #3900 (right). 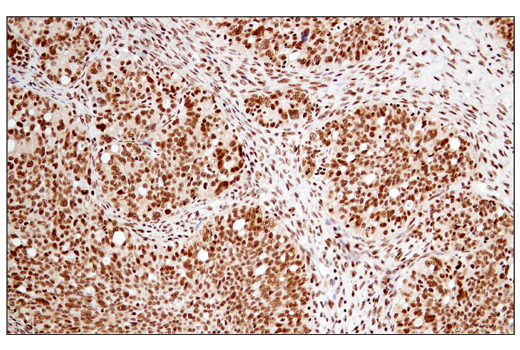 Immunohistochemical analysis of paraffin-embedded human ovarian clear cell carcinoma using RPA32/RPA2 (E8X5P) XP® Rabbit mAb. 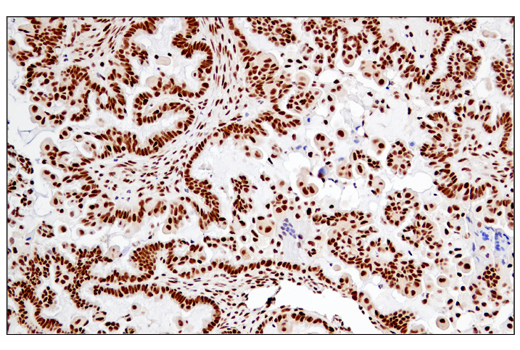 Immunohistochemical analysis of paraffin-embedded human serous papillary carcinoma of the ovary using RPA32/RPA2 (E8X5P) XP® Rabbit mAb. 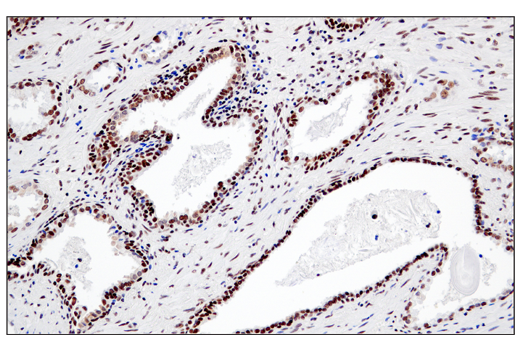 Immunohistochemical analysis of paraffin-embedded human prostate carcinoma using RPA32/RPA2 (E8X5P) XP® Rabbit mAb. 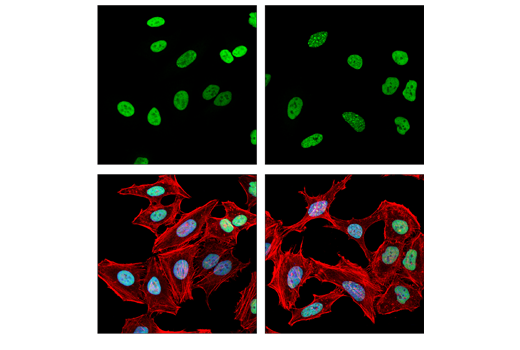 Confocal immunofluorescent analysis of HeLa cells, untreated (left) or UV-treated (right), using RPA32/RPA2 (E8X5P) XP® Rabbit mAb (green) showing translocation to distinct nuclear foci after UV-induced damage. Actin filaments were labeled with DyLight™ 554 Phalloidin #13054 (red). Samples were mounted in ProLong® Gold Antifade Reagent with DAPI #8961 (blue). 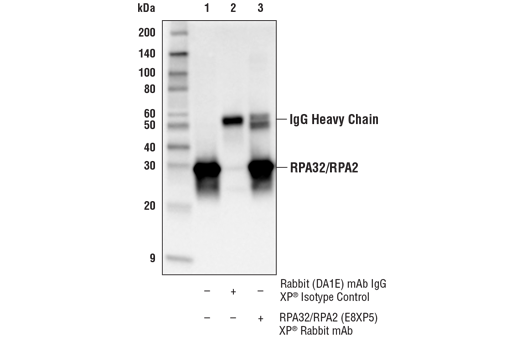 RPA32/RPA2 (E8X5P) XP® Rabbit mAb recognizes endogenous levels of total RPA32 protein. Monoclonal antibody is produced by immunizing animals with recombinant protein specific to the amino terminus of human RPA32 protein.